C. How to switch between Power and Temperature modes: Press the fire button 3 times rapidly to rotate between modes. 1. Adjust the temperature by pressing the Up or Down buttons. The temperature setting will increase or decrease in 1 degree increment. To switch from Celsius to Fahrenheit, press the down button until the temperature reaches the lowest Celsius temperature, 100℃。 Release the down button and then press the down button again and the temperature will cycle to the highest Fahrenheit temperature, 600℉. To switch from Fahrenheit to Celsius, press the down button until the temperature reaches the lowest Fahrenheit temperature, 200℉。 Release the down button and then press the down button again and the temperature will cycle to the highest Celsius temperature, 315℃. To adjust wattage while in TC Mode, press fire button 4 times rapidly to activate wattage adjustment. You will see the “W” wattage icon flashing. 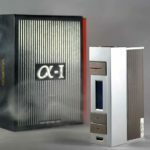 The wattage can be adjusted between a range from 5W minimum to 80W. b) Press Fire button and Up buttons at the same time for 2 seconds to lock the adjustment buttons. (Note: the Fire button will still function when the device is locked.) To unlock, press the Up and Down buttons simultaneously. c) Press Fire button and Down button at the same time for 2 Seconds, the screen orientation will flip. d) Under the Custom Mode(wattage/TC Mode), press the Fire buttons for 4 times to enter the customization interface. 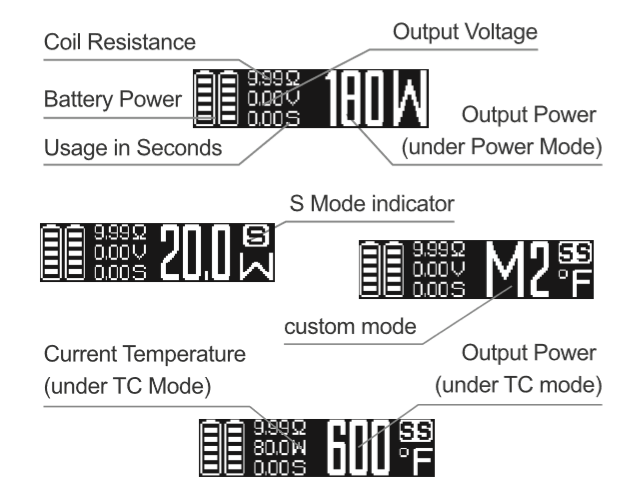 Under Custom Mode, press the Fire button 3 times rapidly to switch between the four custom mode options: Stable Power (W) Mode and the three Temperature Control Modes: TC-SS/ TC-Ni200/TC-Ti. a) Press up or down button to scroll between Modes M1 loM5. b) Press fire button 4 times rapidly to enter the custom power or temperature curve menu. use the up or down button to raise or lower the adjustment value to the desired level, then press the fire button once to set the value and move to the next increment. When you have finished adjusting the curve, press and hold the fire button for two seconds to save and exit. The display will return to the Custom Mode Interface. 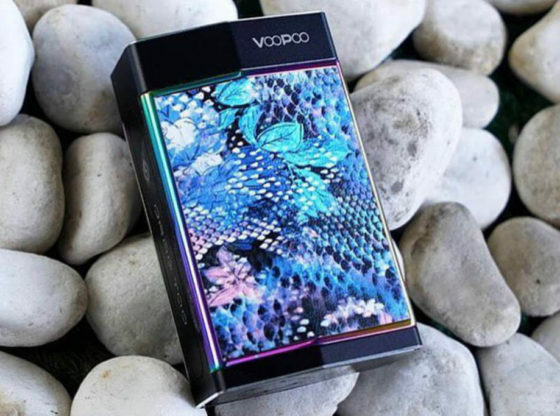 K. VOOPOO Firmware Customization instructions USB charging interface, the product into the charging mode. Charging mode of the fi卤30 seconds, the battery small icon will run as the battery charging which shows that charging began. 30 seconds without any operate, The device will full-screen display battery power large icon running. 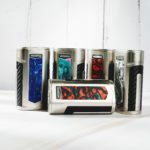 Adding, removing, or charging Temperature control coil types using the VOOPOO Fireware. ii. By default, your device comes with three temperature coil types pre-installed: Stainless Steel (SS316), Nickel (Ni200), and Titanium(Ti). 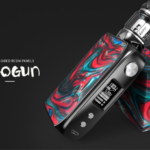 Two more TC types are available using the VOOPOO APP: Ni- Chrome(NC), and a user definable type (TCR), which can be used for any additional coil types. 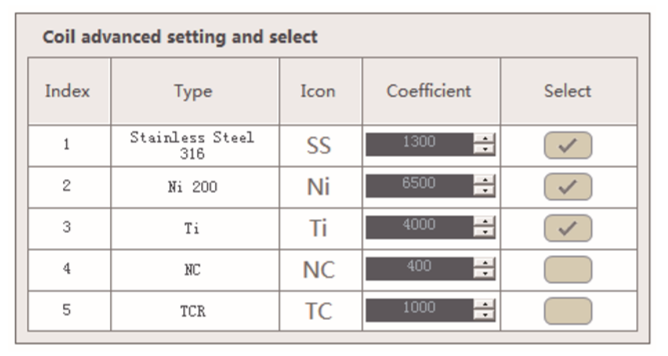 All coil types can be enabled or disabled by checking / unchecking the box in the Select column, and the resistance coefficient can be customized for each by clicking the up or down arrows in the fields in the Coefficient column See image below. iii. At least one coil type must be enabled, and a maximum of 5 coil types may be enabled. b. 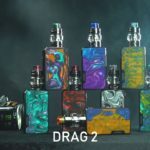 This product supports vaping with single /dual batteries, please put the battery on the battery tray a when using single battery. c. The device uses 5V rechargeable series circuit, and also it supports balance charging. It’s normal for the device to get hot during charging. f. While using the device, do not throw/drop it or immerse it in water etc. Doing so may invalidate the warranty. 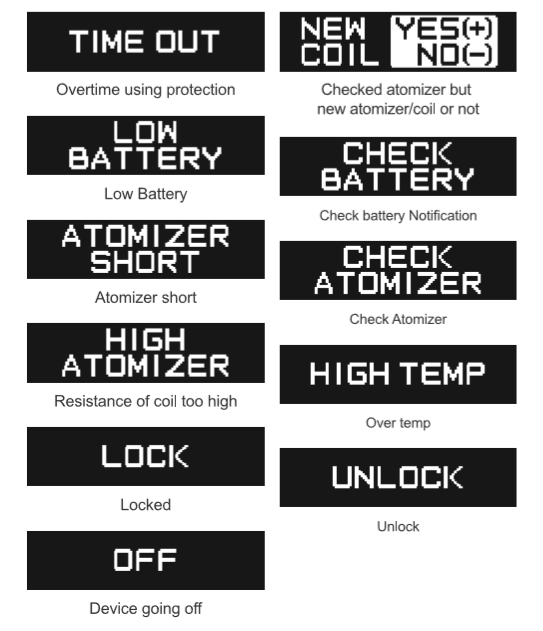 g. Please use the proper working mode for your atomizer’s design and material. h. Do not use batteries whose skin is broken or torn, or which are otherwise not completely insulated. i. This product is intended for use with various strengths of e-liquid, if you come into direct contact with such liquid whist using this product please wash your hands and forearms thoroughly. k. Do not use if you have an unstable heart condition, servere hypertension or diabetes.